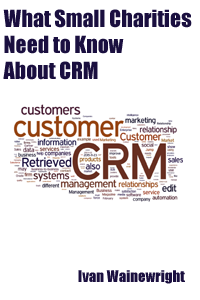 I have updated my free ebook, What Small Charities Need to Know About CRM Systems. Buying a new CRM system or fundraising database can be a daunting experience for any NFP organisation, let alone a small charity. So although I publish a lot of information on my blog which I hope is useful for all charities, this book contains some points which I think smaller not-for-profit organisations need to particularly be aware of or specifically consider. As before, this book has been produced for people whose day job is not the procurement or implementation of new databases – which for small charities is probably almost everyone! And you do not have to be technical to understand it. It is for fundraising managers, chief executives, trustees and fundraisers, but of course I hope it is equally useful for database staff and charity IT staff too. This second version has a brand new section on System Development and updates throughout the rest of the book to reflect my latest thoughts and the software options now available to the sector. Click here to download the PDF for free. Yeah, I read your book, thanks a lot. You know, bowadays there a lot of crm system and honestly say it is not so easy to find really stable and reliable. After an hour of searching I stopped at this one https://www.bitrix24.com/uses/best-free-crm.php. I am sure that it works great.